There are spoilers ahead for the latest episode of Game of Thrones, “Beyond the Wall.” It is currently streaming on HBO Go right now if you haven’t watched it. Or, if you’re someone who enjoys being spoiled before watching the episode, you do you. The answer is yes. And we just watched it happen. Jon “I’ve made a huge mistake” Snow took his men beyond the wall in hopes of capturing a Wight. It is harder than it looks, but while you know that, Jon Snow DOES NOT. He immediately finds himself in over his head and has to send word to Daenerys Targaryen to come and save him. She does. 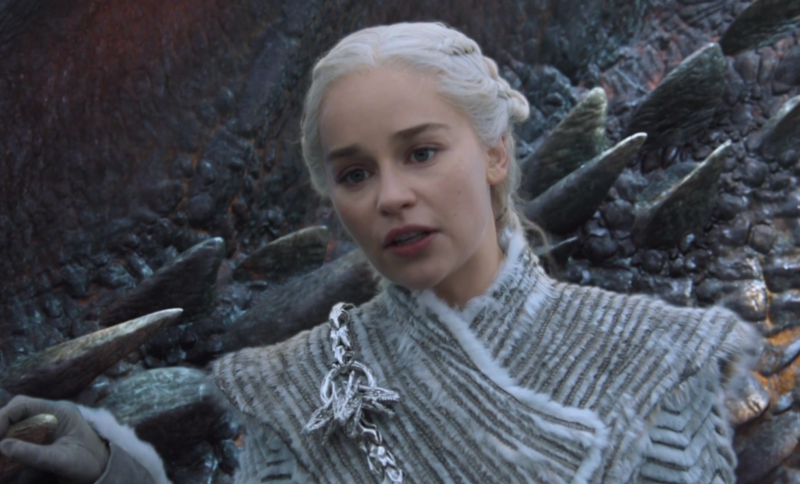 She brings her three dragons with her — Drogon, Rhaegal, and Viserion — and easily vanquishes a good majority of the White Walker army. This pisses off the Night King, because, duh. And since the Night King is really good at throwing spears (?? ), he launches his into the air, and it pierces Viserion. He falls to the ground and sinks into the icky water as Drogon and Rhaegal cry (and so do the viewers at home!!). It was at this moment I was like, OMG THEY HAVE TO BURN THE DRAGON’S BODY, but since I was sitting on my couch yelling this at my TV, and not yelling at Jon Snow, he did not hear me. Earlier in the episode, after Thoros of Myr died, Jon insisted on burning the body, because if there’s still a body laying around, the White Walkers can take it and turn it into another White Walker and/or Wight. As we just learned, the same thing can be done to DRAGONS. This is the worst-case scenario. This is, without a doubt, DEFCON 1 for Westeros. This is…the end. If this were rock, paper, scissors, but instead it’s Valyrian steel, dragons, and White Walker Dragons, PRETTY SURE the White Walker dragon defeats EVERYTHING. How can anyone, including Drogon and Rhaegal, go up against Viserion THE WHITE WALKER DRAGON? There are so many questions about what happens next, and the one I’m still yelling at my television is “CAN HE BREATHE FIRE?” Also, since Viserion was touched by the Night King — actually touched — he’s now got those magical White Walker abilities, so he’s not a wight, meaning he’s not really ~the undead~. He’s dead, sure, but he’s dead and re-animated, and the only thing that can stop him now is dragonglass, and this is so, so bad for Westeros. All along, the joke has been that if Lyanna Mormont had three dragons, this show would have been over two seasons ago. And now, if the Night King had a WHITE FLYING DRAGON all along, this show never would have even started. This is the beginning of the end on Game of Thrones, and no one is safe.